Merry and Bright and some WINNERS! Hello! We have been under the weather with ICE this past weekend but thankfully we did not lose power. However, many friends and family did......with some still without power. 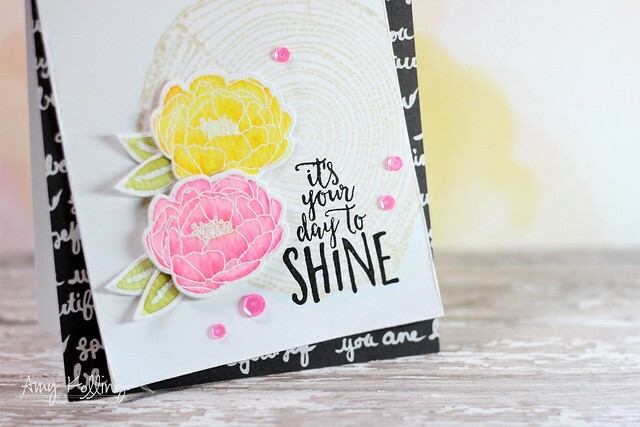 I have another Concord & 9th card share today with the Shine Brighter stamp set. Don't forget that there is still a SALE going on through today! Last week over on Instagram, I had a giveaway posted! I have chosen the winners that each receive this Shine Brighter stamp set! I will be posting this over on IG soon! Thank you all for becoming followers and to Concord & 9th for the giveaway! Hello! Today holds lots of preparing for the Thanksgiving holiday tomorrow. There is ice in the weather forecast and unfortunately we are driving for Thanksgiving lunch tomorrow. :( I hope you all have a wonderful holiday! I have this CAS card today using Penguin Greetings set from Avery Elle. I wanted to create a scene that made them the star of the show. Some simple ink blending for the hill was all it needed! I used Tumbled Glass Distress Ink and the curved die from Snow Caps Elle-ments to achieve this. And ready for a sale? Here's what Avery Elle has for you! Happy Monday! 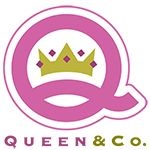 I have the pleasure of Guest Designing for a new stamp company called Concord & 9th. If you haven't checked them out yet, what are you waiting for? They have some amazing innovative dies, stamp sets, and extras like Happy Hues Cards (which I LOVE)! I decided to change up the holiday mantra here and designed a floral card incorporating emboss resist with watercolor. 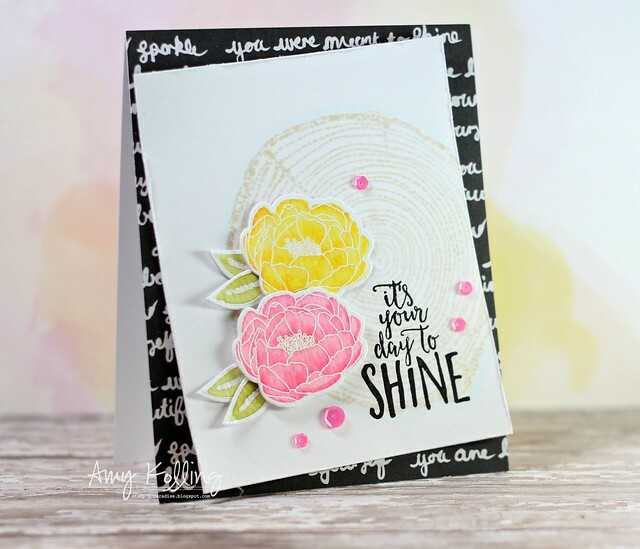 I've used Shine Brighter stamps and dies from Concord & 9th. I began white heat embossing the flower from the stamp set onto Tim Holtz Watercolor paper. Now while there is no "leaf" stamp, I was creative and used the "flame" stamp and added my own "vein" with my Versamark pen. The leaves were heat embossed as well. My images were colored in with Zig Clean Color Real Brush Markers and then washed with my waterbrush to tone them down. They were all diecut with the coordinating dies and set aside. Now.....let's talk about that FABULOUS Tree Ring stamp. I fell in love when I saw this! I stamped the Tree Ring with Antique Linen Distress Ink and washed it with my waterbrush. Here's the part where I wished I had stamped it onto watercolor paper but oh well! I dried it with my heat tool and then overnight put it between some books to help flatten out. To soften the edges, I added a little Tumbled Glass Distress Ink around the perimeter of the Tree Ring. My panel was added to a top folding notecard that was layered with pattern paper from Bella Rouge by Pink Paislee. I didn't adhere the panel all the way but left the corners somewhat turned up. Lastly, I added some sequins from Pretty Pink Posh as embellishments. Now, I did mention a giveaway right? Concord & 9th wants to give one of my followers on INSTAGRAM and a friend the Shine Bright stamp set! 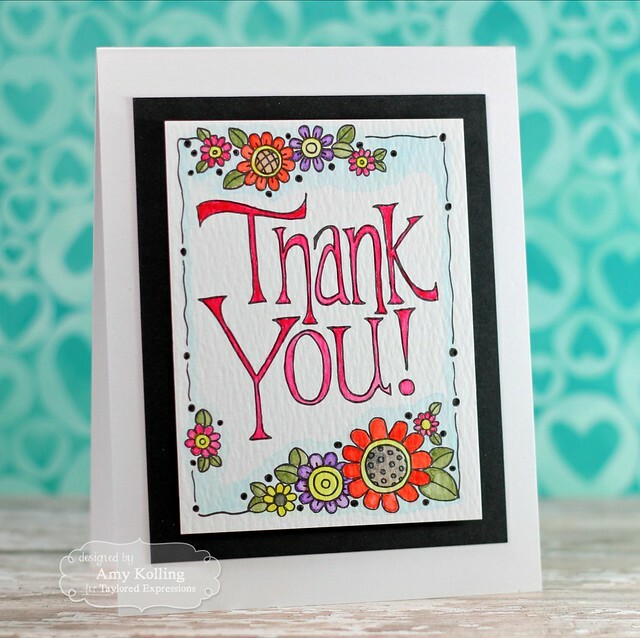 I wanted to share a card that uses these FABULOUS watercolor panels from Taylored Expressions. I am in love with these! These panels are 3 x 4 and are only $4 for 12 panels!!! There is something therapeutic about coloring in these images with a watercolor palette. Check out the FULL post over on the Taylored Expressions blog. 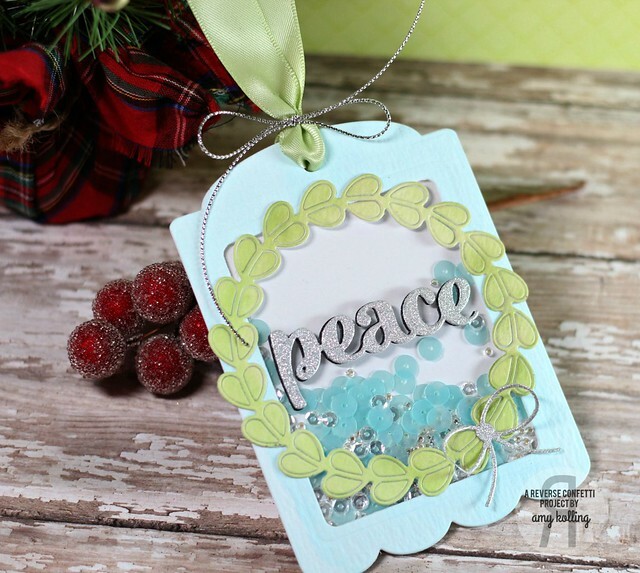 Welcome to the 25 Days of Christmas Tags with Tracey McNeely! I love this yearly celebration of tags! 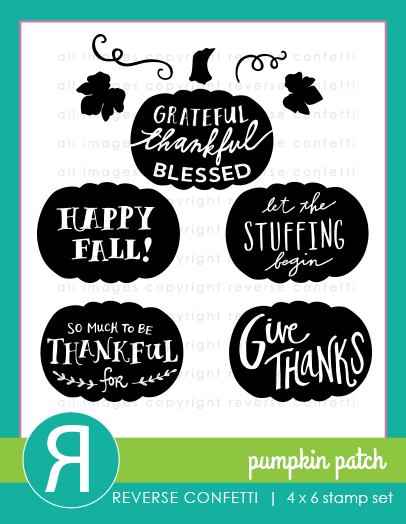 Every day you will find inspiration on Tracey's blog from lots of your favorite stamp companies! Make sure to check out her blog: In My Creative Opinion. Today, I'm sharing a tag as part of the Reverse Confetti day for the 25 Days of Christmas Tags. 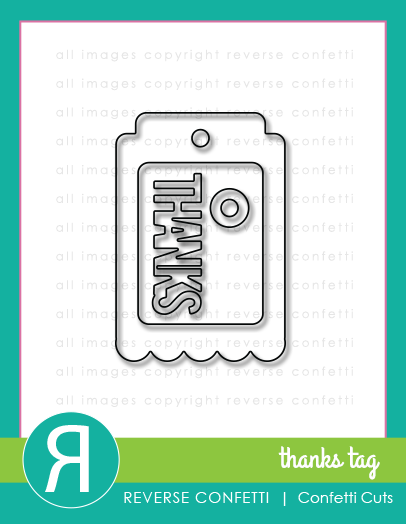 Jen from Reverse Confetti has designed some of the most FABULOUS tag dies......seriously. This tag, Gift Card Holder Tag, is one of the best ones yet. Here I've used the dies included with this set to make a shaker tag with papers I've watercolored with Distress Inks. Loads of flat and cupped sequins along with clear/silver seed beads fill the shaker. 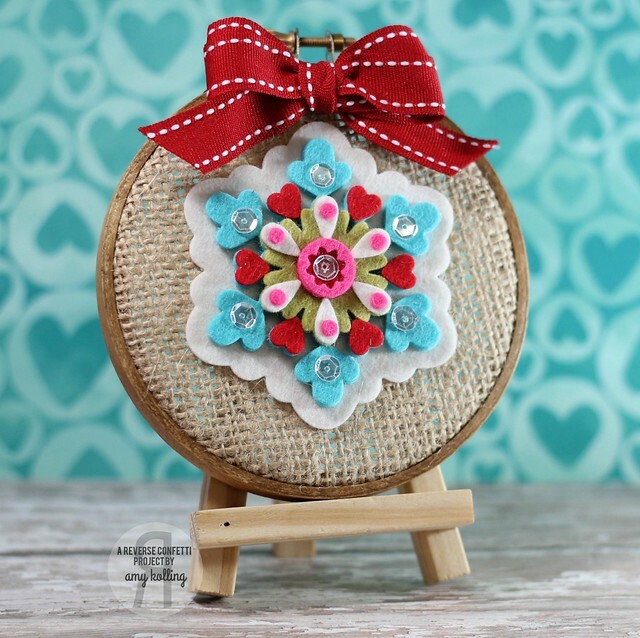 To embellish the frame, I added a Wreath Die and a tiny bow from Tagged Tote Confetti Cuts. The peace sentiment is from the Winter Words Confetti Cuts. Find out all the details about the 25 Days of Christmas Tags HERE. Right at Home for the Holidays! Hello!! Welcome to the Right at Home for the Holidays Inspiration Guide E-book Launch! I am so excited to help Nicole in launching her Holiday E-book! Included are lots of fun ideas that will make your holiday crafting a breeze. 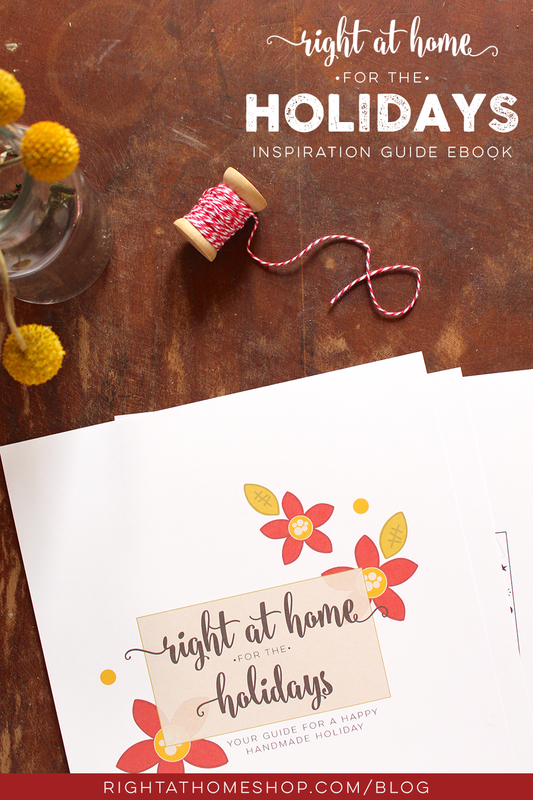 For $5, you will receive the digital download of this book with 6 pages full of holiday-themed ideas meant to make your season's bright. Alongside each project will be a complete supply list and instructions. 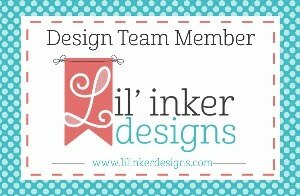 For my card, I was inspired by one of the layouts Nicole shares in her E-book. If you need a little direction on a card, using a layout (or sketch) is GREAT!!! 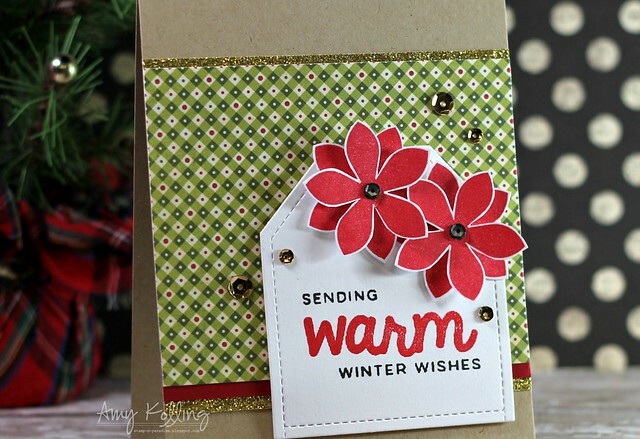 Using stamps from Nicole's Holiday Release, I stamped and fussy cut my florals. 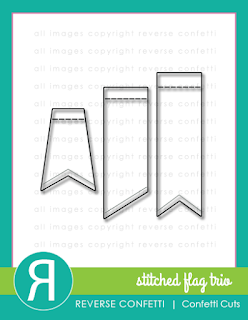 These were added to a diecut stitched tag with foam adhesive. For my sentiment, I cut my stamp apart.....gasp, I know. By doing this, my sentiment can be easily stamped in 2 colors. Gold sequins from Pretty Pink Posh were added to finish off the card. I am joined by several Instagram friends for today's E-book Launch. Here is a list of everyone! 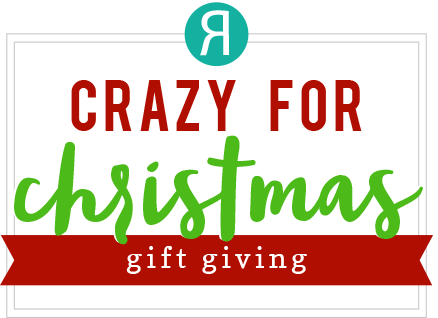 Today, I'm sharing a tag as part of the Pretty Pink Posh day for the 25 Days of Christmas Tags. PPP has some amazing tag dies or shapes that can be made into tags. I've used the Stitched Banner Duo 2 for my tag and Stitched Borders 1 for the snowy hill. Did you know that Paulina is now designing her own stamps??? They are adorable!! 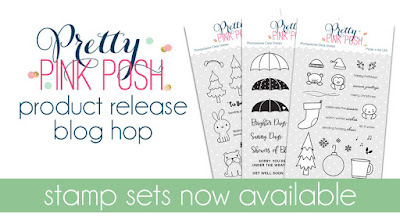 That cute bunny is from the NEW stamp set called Holiday Pals. 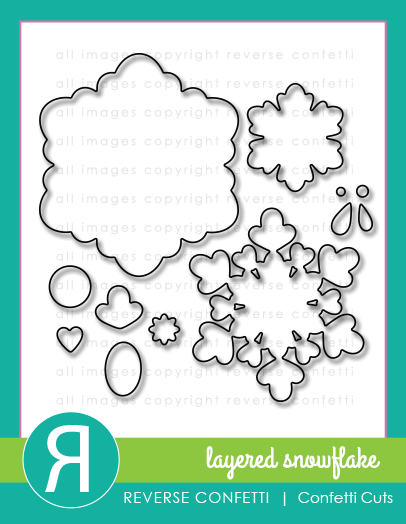 Tumbled Glass Distress Ink was blended into the background and snowflakes were white heat embossed. All images were colored with Copic markers. Welcome! How can it be Wednesday already? The week is just flying by or maybe it's because Thanksgiving is next week and Christmas follows quick. 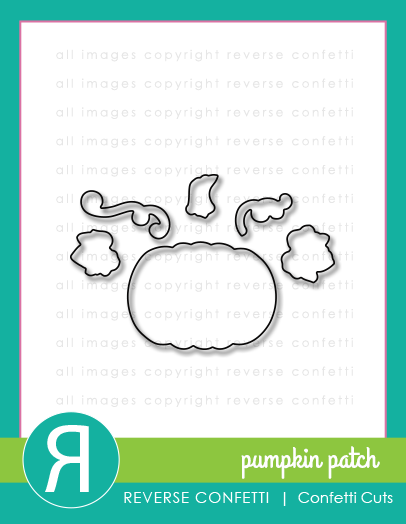 Anyway, I have a card that can also be seen over on the Avery Elle blog. I've used the Christmas Florals stamps and coordinating Elle-ments dies. I began my layout with a diecut circle from the Burst Dies Elle-ments and used the Pierced Circles Elle-ments for a little detail. After stamping and diecuting my florals with Cherry, Magenta, and Jungle Pigment Avery Elle ink, I arranged them on the right side of the pierced circle. The font for the sentiment is just perfect for a classic Christmas card. A sprinkling of Silver Sequins from Pretty Pink Posh were added as embellishments. Since Thanksgiving holiday is coming up, I thought I'd pull out the Pumpkin Patch stamps and matching Confetti Cuts for this month's SFYTT! I started by diecuting 2 tags from the Thanks Tag Confetti Cuts and trimming the tops off. To add some pattern to my layout, I stamped the trimmed tags with Whole Lotta Dots stamps. I added a diecut gold glitter banner from Stitched Tag Trio Confetti Cuts. I stamped, diecut, and assembled my pumpkin and added it over some gold thread with foam adhesive. A few gold sequins from Pretty Pink Posh were added to complete the sketch. My first card uses the ADORABLE Holiday Pals and Dies. I love that these can be used for more than just holiday. I paired the Holiday Pals up with the Stitched Photo Frame Dies and created a little photo collage! To one of the photo frames, I made it into a small shaker with the new 4mm Holly Jolly Christmas sequins. For my background, I lightly added Tumbled Glass Distress Ink just where the photo frames were positioned leaving some white space around the perimeter. I love the tiny sentiment in this set and stamped it at angles along with the frames! My second card uses a set that is sure to be a hit.......Rainy Days. The fonts and all the elements that are included make this a must have set for 'thinking of you' cards or just to cheer someone up! I white heat embossed the raindrops stamp for my background and only did this about 3/4 the way down the card because I wanted to leave a space to stamp my sentiment. 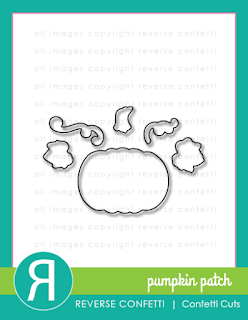 This scalloped frame is from a new set that is EXCLUSIVE to the PPP shop and is called Scallop Frames Dies. Here I've diecut 2 and glued them together for dimension. I stamped and diecut the umbrella pieces and added those inside the frame. Now for the fun part! The PRIZES!!! 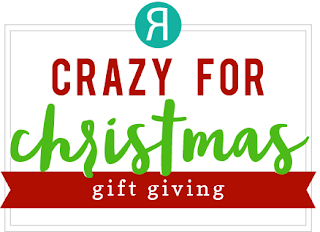 There will be 4 (four) $25 gift certificates up for grabs (2 for each day). Winners will be picked randomly along the blog hop. Comments must be left by 11:59 PM PST on 11/16/2015. Winners will be announced on the PPP blog on November 18th. Welcome back! It's a busy day here for my blog but I have an adorable gift bag and tag that can be seen over on the Avery Elle blog. I started by diecutting and assembling my gift box using the Classic Bag Elle-ments. A few pieces of Scor-Tape is all this box needs to assemble! What is awesome about this bag die is that it cuts 2 slits on each panel so you can thread ribbon through for an easy bow! My tag is from the Pocket Tag Elle-ments and was colored with Distress Ink and hills from the Snow Caps Elle-ments were added to create a tiny scene. My cute penguin is from the Snow Much Fun stamp set which was cut out using the Snow Much Fun dies. 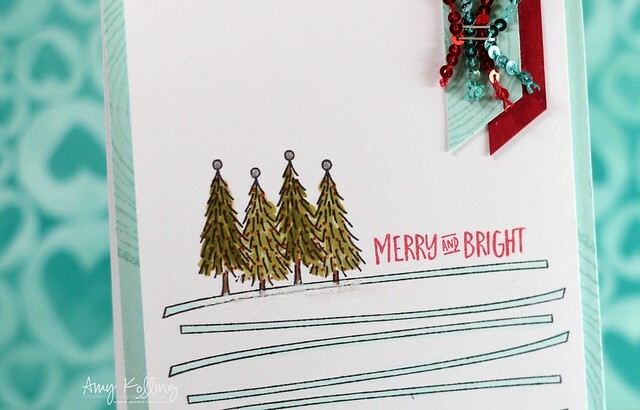 My sentiment was pieced together from Snow Much Fun and the die cut word "Merry" is from the Holly Jolly Elle-ments. 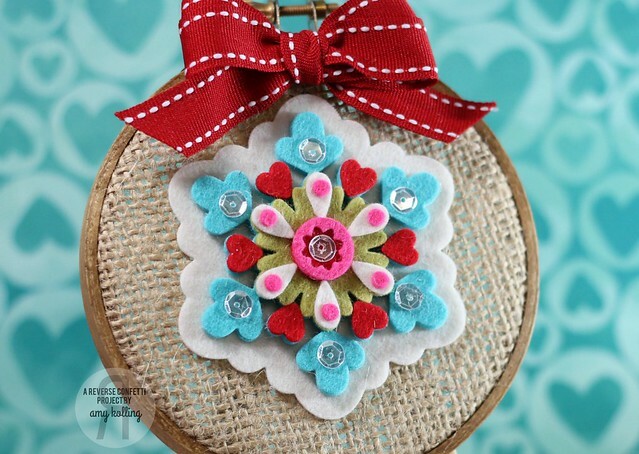 Welcome to Day 2 of the online event........Crazy for Christmas with Reverse Confetti! 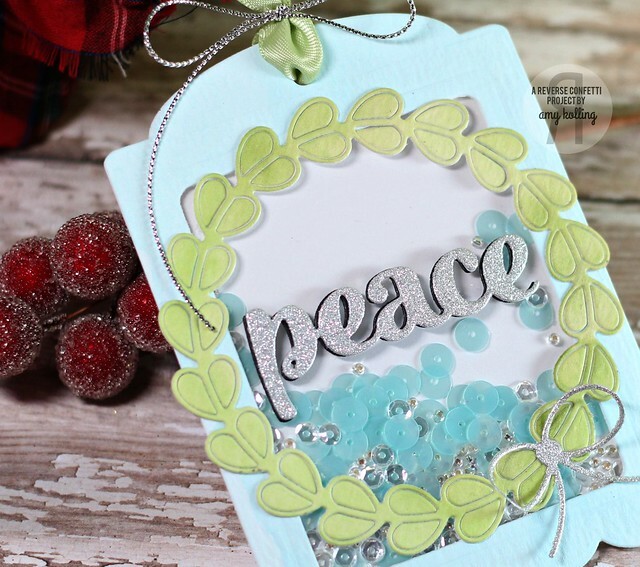 There is lots of inspiration using Reverse Confetti product for amazing Christmas projects! 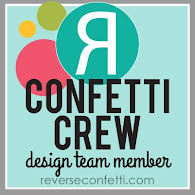 Make sure to check out the Reverse Confetti Blog for a full list! 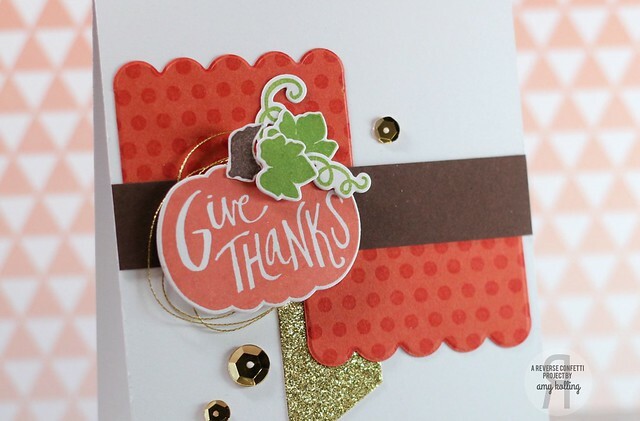 Today we are sharing projects that are all about "Gift Giving"! I have wanted to create an embroidery hoop project for a while. What better than to make a mini one with the Layered Snowflake Confetti Cuts! I've used some fun bright colors for the holiday and hopefully this piece of art can be displayed through the winter! Since we are all about "gift giving".........this little decor piece will be finding a new home soon! I started by distressing my hoop with some Frayed Burlap Distress Ink and then stretched a section of burlap into the frame and secured. Let me tell you......making these snowflakes is ADDICTING! There are so many possibilities! When I pulled out my colors of felt, I just couldn't decide! As a finishing touch, I added some Sparkling Clear Sequins from Pretty Pink Posh! November Verve Diva Inspiration Hop! Concord & 9th Guest and New Release!